Julian in 360 proclaims at the Palais des Thermes. Was found in 1850. Statue de l’empereur Julien, proclame en 360 au palais des Thermes. 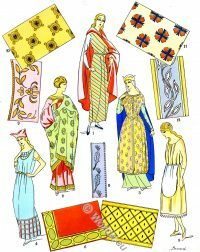 Fut trouvée en 1850. Julian was a grandson of Emperor Constantius I., a nephew of Emperor Constantine the Great and a cousin of Emperor Constantius II. Julian was the gentile name of imperial dynasty, Flavius, the name of his alleged ancestor Claudius Gothicus and the name of his grandfather, Julian. He had two older half-brothers and a half-sister, the children of the Galla, the first wife of Julius Constantius. 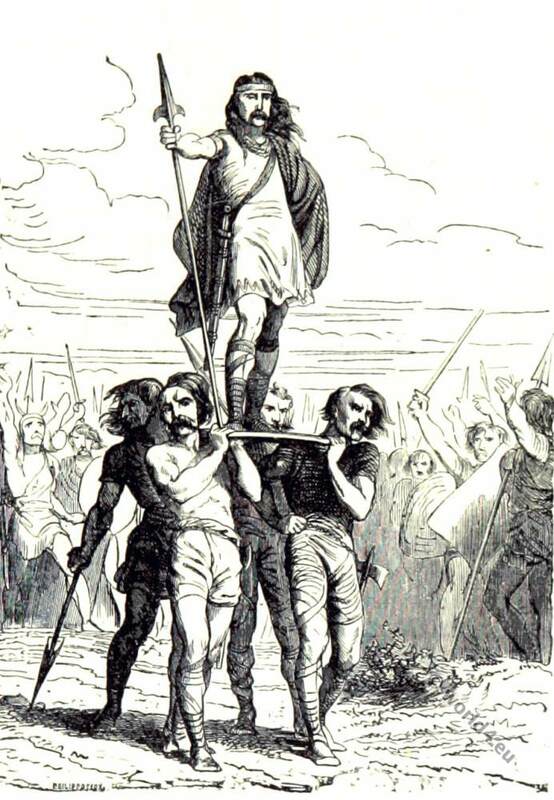 His cousin named Julian 355 to Caesar (Under Emperor) and commissioned him to defend Gaul against the Germans. He fulfilled this task with great success. 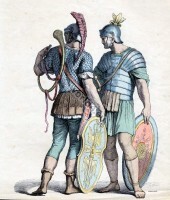 He let himself proclaim by wearing on a shield after Germanic tradition as Roman emperor and appointed in the year 361 the Gallic senator Claudius Mamertinus as consul. The appointment to the king by wearing on a shield was customary with the Goths and Frankish kings of the Merovingian to the beginning of the Carolingian period. By Pippin III. the anointing was introduced and then replaced by enthronement and coronation. Julian was the only Roman emperor, who moved to paganism by Christianity. His predecessor, the Roman Emperor Constantine had not yet raised Christianity as the state religion, which should be done first under Theodosius I.. He renewed pagan cults and their ruined temple and presented the priesthood again. 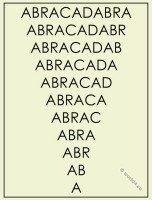 He banned the provision of education in pagan literature by Christian teachers. Contrary to later tradition he never executed Christians because of their faith. In his work Contra Galilaeos (Against the Galileans – so he called the Christians) and in many letters he showed mistakes and dangers of the Christian faith and portrayed Christians as apostates of Judaism, a much older and generally accepted religion. According to the church historian Sozomen he formulated as follows: “I have read, I understand, I have rejected!” He died on June 26 at Maranga on the Tigris, as his role model Alexander the Great at the age of only 32 years. With him ended the Roman Constantinian dynasty. As for the pictorial representations, so consists in research for several years through the view that there is no secured contemporary illustrations of the Emperor beyond the coins. This also applies to the famous statue, today located in Paris that has often been interpreted as a contemporary portrait Julians. 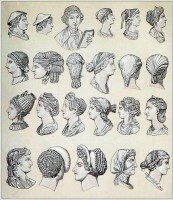 Ancient roman hairstyles of woman and men. 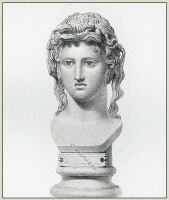 Bust of a Bacchante. 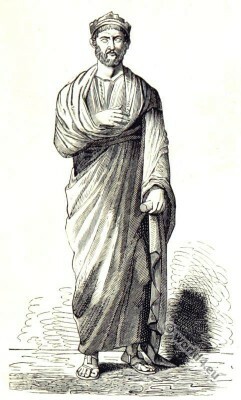 Maenad of Dionysiac cycle.